During the European press launch of the Q3 in Switzerland last week, Audi surprised journalists by mixing in something a little hotter to their range of new compact crossovers. Powered by a 300 horsepower derivative of the TT RS/RS3's 2.5-liter inline five cylinder, Audi makes it clear that a plan for performance-minded SUVs is certainly on the table. 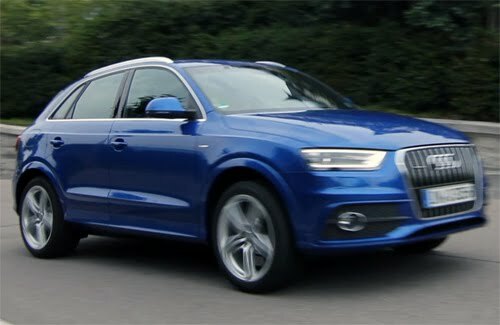 Luckily for us, Swedish motoring site, Sportbilen.se filmed their ride in this new Q3 2.5 TFSI prototype. More information and video after the jump. While Audi has not yet released any official details on the vehicle, Car and Driver's European correspondent, Jens Meiners did expand on what to expect. According to Meiners, outside, this Q3 prototype only differentiates itself from lesser powered models by special paint and wheels. And for now, the range-topping compact SUV does not carry a "S" or "RS" badge, instead being referred to simply as the Q3 2.5 TFSI. As Meiners points out though, this vehicle is still "a year or so" away from production, which gives Audi plenty of time to expand on the naming and styling.